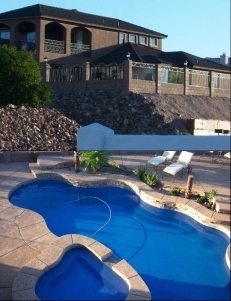 Client Notes: Ed and his wife Christina along with our team at A Better Builder Construction have designed this vacation getaway with awesome casino views. This 2784 sq ft home with 4 bedrooms and 3 baths is just what they need to bring the family together for vacations. The nearly 1200 sq ft garage will accommodate the toys while the 700 sq ft patio looking at the Colorado River will be perfect for BBQ's. Entertaining his guest inside will be easy with a spacious great room complete with wet bar, large kitchen and views of casino lights from every window. Special features include tray ceilings double step coffered ceiling built in entertainment center and much much more.